The Wenceslas of the song “Good King Wenceslas” wasn’t a king, but actually the Duke of Bohemia who lived in the 10th century. He was reputable as a good, kind, honest, and morally upright man. 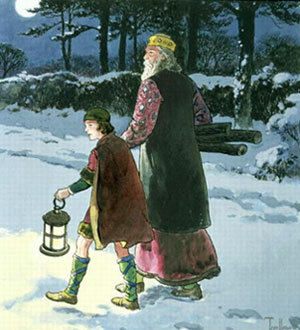 The carol is about Wenceslas and his page going out giving alms to a poor peasant in bitter cold weather on the Feast of Stephen, the second day of Christmas (December 26). Wenceslas was perhaps too good, because he was betrayed and murdered by his envious younger brother in 935. He immediately achieved sainthood status, and within a few decades, four biographies of him were in circulation. The song is based on a 13th century springtime carol sung in Latin, “Tempus adest floridum,” or “It is time for flowering.” In 1853, John Mason Neale selected Wenceslas as the subject for a children’s song to illustrate Christian generosity. “Hither, page, and stand by me. “Mark my footsteps, my good page.